The Secretariat of the Global Biodiversity Information Facility (GBIF), located in Copenhagen, Denmark, is seeking a dynamic Science Writer, to help communicate the value of GBIF’s work to key audiences. Hi, I’m a freelance journalist based in Bristol, UK. My specialist areas include sustainability, the environment and development. 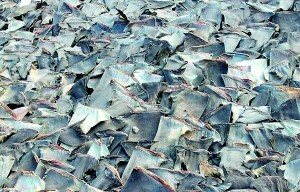 An international study has placed Sri Lanka among top 20 countries that catch sharks. Noting that these 20 countries account for 80% of the world’s annual shark catch, a report based on the study puts the survival of many shark varieties in their hands. The Netherlands – The Healthy Seas initiative’s call for used and discarded fishing nets has brought in 15 tons of nets this summer. The salvaged nets are being stored in the first Healthy Seas depot in Scheveningen harbour, the Netherlands, and will be offered for recycling at the end of the salvage season.